Like a lot of people I had fond memories of the Pop-O-Matic from my childhood. The concept was really simple. 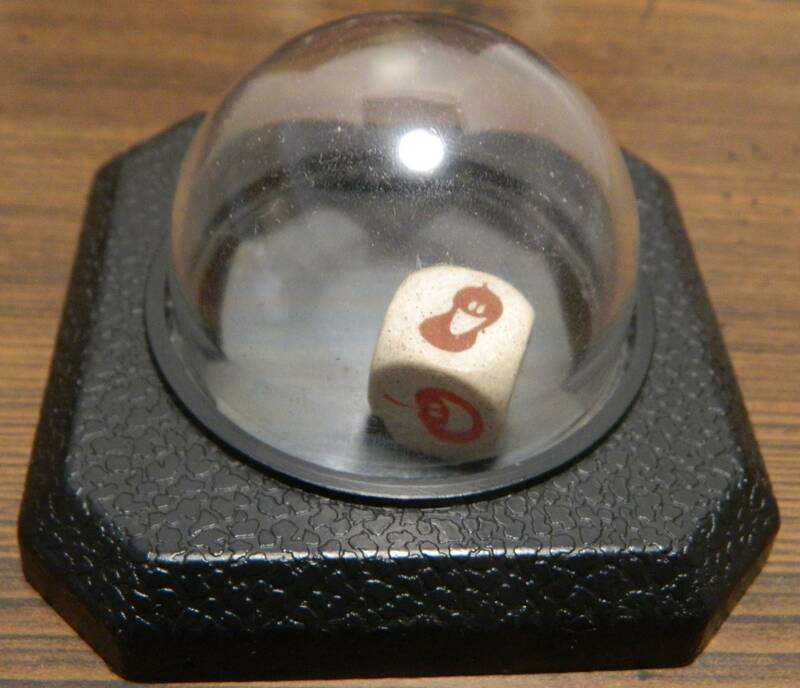 A dice was placed inside a plastic dome with a thin piece of metal on the bottom. You would press down on the top of the dome which would press down on the metal which created a popping noise while rolling the dice. 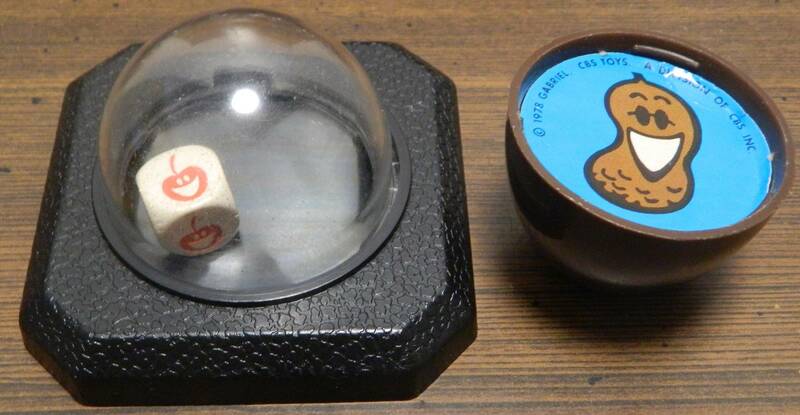 The description of a Pop-O-Matic dice popper probably sounds really stupid and yet it is surprisingly satisfying. Unfortunately the device was pretty much only used in children’s/family games. While the device was so satisfying to use, games that used them were generally quite unsatisfactory as the underlying gameplay usually was not particularly good. 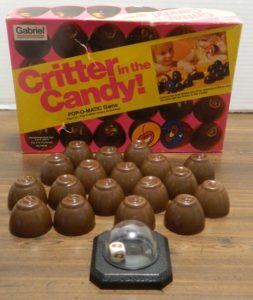 I normally wouldn’t even pick up a game like Critter in the Candy! as it looked like a young children’s game. I am a sucker for Pop-O-Matic games though and I can’t resist a really cheap board game. Critter in the Candy! is a very basic children’s memory game that will entertain young children but will leave everyone else bored. How to Play Critter in the Candy! Place all of the candies face down and mix them up so no one knows what is under each candy. 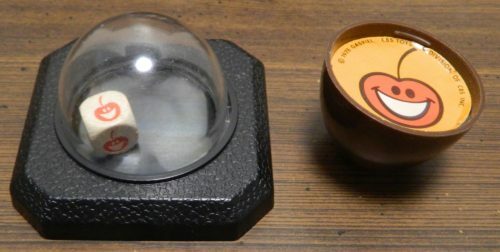 A player begins their turn by popping the Pop-O-Matic. The symbol that appears on the top face of the die determines what the player is looking for. The player must choose one of the face down candies and reveal the symbol underneath. Based on what symbol is underneath the candy, one of three things will happen. This player has rolled the peanut. On their turn they will need to try to find a peanut candy. If the symbol under the candy matches the symbol rolled, the player gets to take the candy for themself which will be worth one point at the end of the game. This player has found the candy matching the symbol they rolled. If the symbol under the candy is different than what was rolled (peanut when you rolled cherry, cherry when you rolled peanut), you will not get to take the candy. You will place the candy face down along with the rest of the candies. This player rolled a cherry. They picked a peanut so they chose the wrong candy. They will place the candy back with the rest of the candies face down. If the symbol under the candy is the critter, the player has to return one of the candies they acquired on a previous turn. The candy they are returning along with the critter candy are placed face down along with the other candies. If you have no candies when you reveal the critter, you only have to put the critter back. This player found the critter candy. They will have to return one of their candies to the middle of the table along with the critter candy. The game ends when all of the candies except for the critter have been claimed by one of the players. Each player counts up how much candy they acquired during the game. The player who acquired the most candy wins the game. The top player has collected more candies than the bottom player so they have won the game. My Thoughts on Critter in the Candy! To be completely honest there isn’t a whole lot to talk about when it comes to Critter in the Candy!. The game is pretty much your basic children’s memory game. You use the Pop-O-Matic to roll the dice. You then need to try and find one of the candies that feature the ingredient that you rolled. If you find a matching candy you get to keep it. If the candy has the other ingredient on it you put the candy back. Finally if you pick the candy with the critter you have to put it back along with one of your other candies. Whoever ends up with the most candy at the end of the game wins. To get right to the point I will say that I am clearly not the target audience for Critter in the Candy!. The game is recommended for ages 3-6 and that is immediately evident. The game is a very basic memory game that is not going to appeal to anyone older than five or six. The game is just too basic where there is no challenge and thus the game becomes boring really quickly. I am not a big fan of memory games but Critter in the Candy! is not even much of a memory game. Each candy in the game can only be one of three things. Other than really young children, there shouldn’t be any problems remembering which candy is which when they are returned to the table. Therefore the game becomes a test of who gets luckiest in rolling the die and randomly choosing candies when you haven’t seen any candy of the ingredient you rolled. 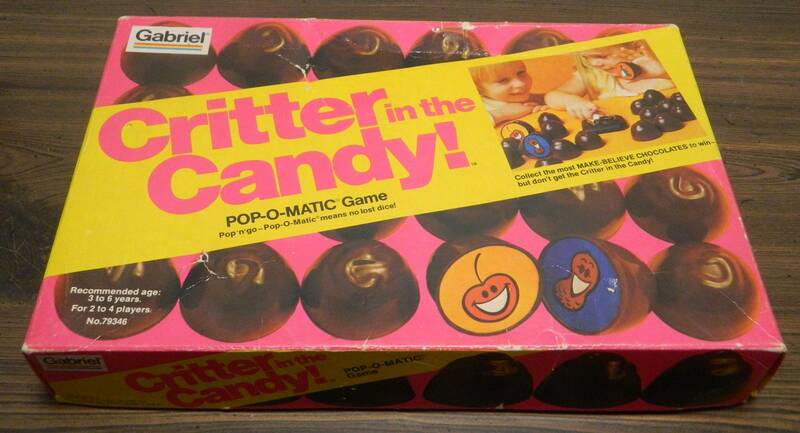 While I like the Pop-O-Matic component, I think it actually does more harm than good for Critter in the Candy!. Using the Pop-O-Matic is as enjoyable as ever. Unfortunately all it does is add an unnecessary mechanic to a memory game which ultimately makes the game rely on even more luck. What you end up rolling will determine what you need to find on your turn. You might know what is under several of the candies but you can’t pick them up unless you roll the right ingredient. In addition you could end up rolling one of the ingredients and know that all of the corresponding candies have already been taken. Your turn is then wasted as there is no way you can find a matching candy. Unless one of the players struggle in memory games, the winner of the game is going to come down to who is luckier. At this point some people are probably thinking that I am being a little harsh on the game since it is supposed to be for young children after all. I tend to agree but I think the game should be judged for both its target audience and as an overall game. Objectively Critter in the Candy! is not a good game. 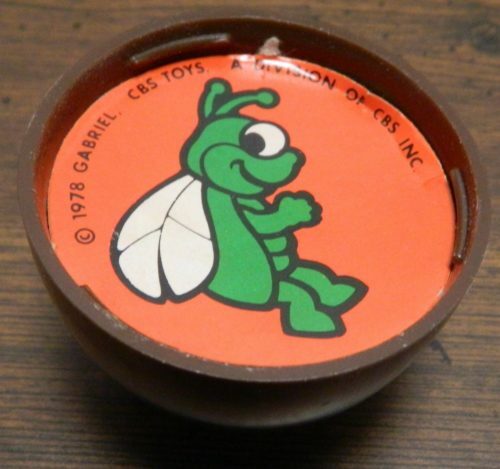 At the same time though I think Critter in the Candy could be a game young children really enjoy playing. The game is simple enough that young children should have no trouble playing it. The addition of the Pop-O-Matic and the theme should really appeal to young children as well. I think children within the recommended age limit could really enjoy Critter in the Candy!. I just wouldn’t recommend it to anyone over the age of six unless you are playing the game with a young child. As far as the components I thought they were okay but could have been quite a bit better. The Pop-O-Matic popper is similar in quality to every other game that featured the device. Forty years later and it still works quite well. The candies on the other hand are kind of hit and miss. The candies are made of pretty thick plastic with cardboard pieces inserted into the bottom making them pretty durable. Maybe it is just me but they don’t really look like candies though. You can use your own imagination, but they don’t look like very appealing candies in my opinion. Should You Buy Critter in the Candy!? Critter in the Candy! is basically what you would expect out of a children’s memory game. You basically just roll the die and try to find a candy that matches what you rolled. The player who gets the most candy during the game wins. The game has a recommended age of 3-6 and it shows. The game is way too simple as there are only three symbols in the game. Other than really young children you are going to remember what is under every candy that is put back. The game then relies on getting lucky by randomly guessing the correct candy and rolling the right ingredients. The game gets boring quickly for older children and adults. I could see the game appealing to younger children though as they will enjoy using the Pop-O-Matic as well as the theme. Unless you have young children there is no reason to pick up Critter in the Candy! as the game is way too simple. If you have young children it may be worth picking up Critter in the Candy! if it looks like a game that they would enjoy and you can get a good deal on it. Simple enough that even the youngest children can play it. The theme is cute and should appeal to young children. Way too simple for everyone but really young children. Relies on a lot of luck for a memory game.